City on August 20, 2018. After it was submerged in waist-deep flood last July, the refurbished AIR21 business hub is up for business again and ready to accept your documents and packages for delivery in and outside the Philippines. distribution, sea freight and its new offering, the AIR21 Backhaul Service. “Hindi n’yo na kailangan mamalengke. Kami na ang magdadala ng gulay sa inyo. 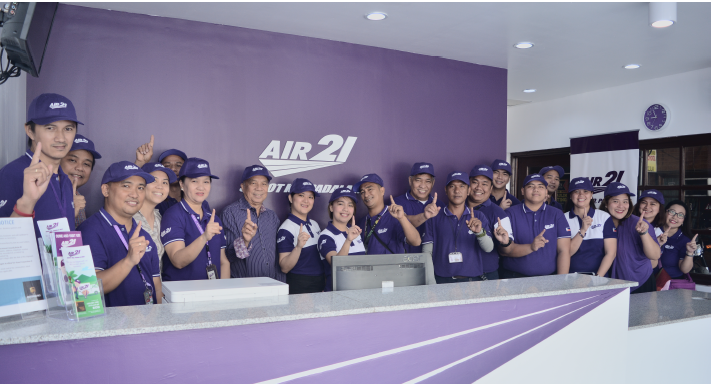 AIR21 Backhaul bridges our local farmers’ goods to every Filipino’s doorstep,” said AIR21 Founding Chairman, Alberto D. Lina. The event was attended by Philippine National Red Cross’ Alwyn Baltazar and Jewel Macatangay who also assisted during the motorcade. Seventeen vehicles Olongapo City traversed from the hub location to Ulo ng Apo Rotonda, right to 24th Street, then right to Elicano Street, past to 20th Street up to Gordon Avenue and Magsaysay Drive back to the AIR21 business hub. Olongapo City councilors Engr. Bas D. Palo and Jerome Michael Bacay also graced the event. Bajac, Olongapo City. Sa AIR21, Sagot Ko, Padala Mo!